Brigham Young University Philharmonic Orchestra directed by Kory Katseanes. Edith Stuyvesant Dresser Vanderbilt (1873-1958) was an American philanthropist. Carl Perkins (August 16, 1928, Indianapolis, Indiana – March 17, 1958, Los Angeles, California) was an American jazz pianist. Hermon Palestine Carpenter, born September 5, 1877, died August 12, 1958, was an educator and founder of Montverde Industrial School, now Montverde Academy, in Montverde, Florida in 1912. 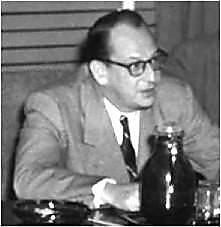 Gordon Evans Dean (December 28, 1905 - August 15, 1958) was a Seattle-born American lawyer and prosecutor who served as chairman of the US Atomic Energy Commission (AEC) from 1950 to 1953.